This short, circular walk takes in an array of sights, including an abbey, an ancient inn, the remains of a Benedictine Priory and an ice house buried deep in the woods. Start your walk in Bisham village, just off Bisham roundabout on the A404 between Maidenhead and High Wycombe, where Marlow Road meets Temple Lane on the corner by the monument. This is just around the corner from Bisham Abbey. Bisham Abbey is now one of five National Sports Centres, probably best known as where the England football team train, but it was originally built around 1260 as a community house for the Knights of the Templar, one of the most famous Christian Military Orders. King Edward II laid the foundation stone himself. Queen Elizabeth of Scots, the wife of Robert the Bruce, was confined there. Later Henry VIII granted the house to Anne of Cleves as part of her divorce settlement. The Hoby family, whose effigies can be seen in the nearby riverside church, who owned it until 1768, were visited by Elizabeth I who governed from there for a while whilst in exile. The ghost of Lady Hoby is said to haunt the Tower Room after she beat her son to death. From the monument, follow the “1½ mile to Hurley” sign along Temple Lane, turning right and then left, and continue along the road where it starts to follow the Thames. At the corner of Bradenham Lane, the lane peters out to a path around Temple Weir House. Go under the small passageway and follow the path through the woods and out across the wheat fields, past the footpaths that go off to the river on the right. The footpath narrows as it comes into the village and meets the High Street. Here you’ll come out next to the Olde Bell Inn, which was built in 1135 and is reputed to be the oldest inn in Britain. If it’s between 3pm and 6pm when you arrive, stop for afternoon tea, and admire the tea cosies knitted by the local Women’s Institute. Once refreshed, turn right along the High Street and continue into Hurley village, known by the Danes as Herlei. There’s a farm shop which is open to 5pm on the left, and the 14th Century Church of St Mary the Virgin on the right. The nave of St Marys is what remains of the Benedictine Hurley Priory, which originally stood here from 1086. An original Tudor barn, dovecote and moat can also be seen nearby. From the church, continue along the High Street and join the footpath at the end to the Thames. The path crosses over to Hurley Lock by a wooden footbridge. Pass through the lock (although stay on the same side for now) and then cross over the next footbridge to the other side. From here it’s about 2 miles to Marlow. There are lots of picnic tables by the river here so it’s an ideal place to eat your sandwiches. Follow the Thames Path signs and continue on the south bank of the river, until a third, longer wooden footbridge takes you over to the north bank. Pass through Temple Lock, one of the Thames’ rare ‘double’ locks, where two chambers exist side by side. Sadly, the old chamber is no longer used and is now becoming overgrown. Watch out for wildlife on the path, the butterflies are particularly active right now. You’ll pass Bisham Abbey and the church from the other side, giving you great photo opportunities across the river. Along the path, you’ll pass through a kissing gate and over two more small footbridges. This then takes you right into the town of Marlow. As you enter the town, Higginson Park is on the left. You can cut across the park to explore Marlow’s shops and cafes, Fego Caffe on the High Street is especially good. As you cross the park, look out for the statue of Steve Redgrave on the left in front of Court Garden House, commemorating his five successive Olympic gold medals. Have a walk around the Millennium Maze too. The multi-coloured brick path, designed by famous maze-maker Adrian Fisher, shows the history and heritage of Marlow. To complete the circular walk, follow the Thames down to Marlow Suspension Bridge and cross to the opposite bank. Although a crossing has existed here since 1227, the existing bridge was built in the 1830s. It is one of only two surviving bridges by designer William Tierney Clark. The other, the Széchenyi Chain Bridge across the Danube in Budapest, had the longest span for the world for a time at 666 feet long. From the bridge, walk along Marlow Road and right onto Bisham Road back towards Bisham village. There are a couple of footpaths along here on the left which appear to take you over to Bisham Woods, but you’d have to cross the busy A404 and there’s no tunnel or bridge across. It’s probably safer to walk back along Marlow Road towards the monument, then stay on Marlow Lane to Bisham roundabout. If you fancy an extension to the walk, Bisham Woods on the opposite side of the A404 is ideal. Enter the woods safely by taking the small side lane, off the Pinkneys Green exit on the opposite side of the roundabout. Follow this road past the picturesque cottages and into what are actually connected individual woods with enticing names; Quarry, Fullness, Inkydown, Park, Goulding’s and Dungrovehill. Further down this lane, you come across an ice house built around 1760 for storing winter-gathered ice for preparing desserts, chilling wine and preserving meat and dairy at Bisham Abbey. Using saltwater, ice could be kept here for up to three years, as the house is built in the shade, right in the soil, with the entrance facing the North wind. 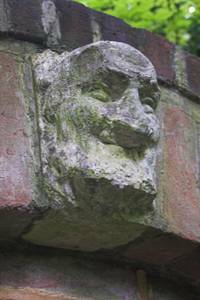 The old man’s face on top of the ice house represents an effigy of good living. There are many maps and information points in the woods giving details of the paths you can take, but beware that some of the chalk slopes can be very steep. The paths are marked in yellow for walkers and blue for cyclists. The woods are an SSSI (Site of Special Scientific Interest) and a beech wood Special area of Conservation.